We come now to the second chapter of this first book and find that it shifts the emphasis from God’s promise to His provision. Libra and its three decans will show the theme of God taking the initiative to make all necessary provisions for the completion of what He had promised in the first chapter of Virgo– the promise of a Seed or Branch that would be the desired of all nations who would become the suffering Savior. 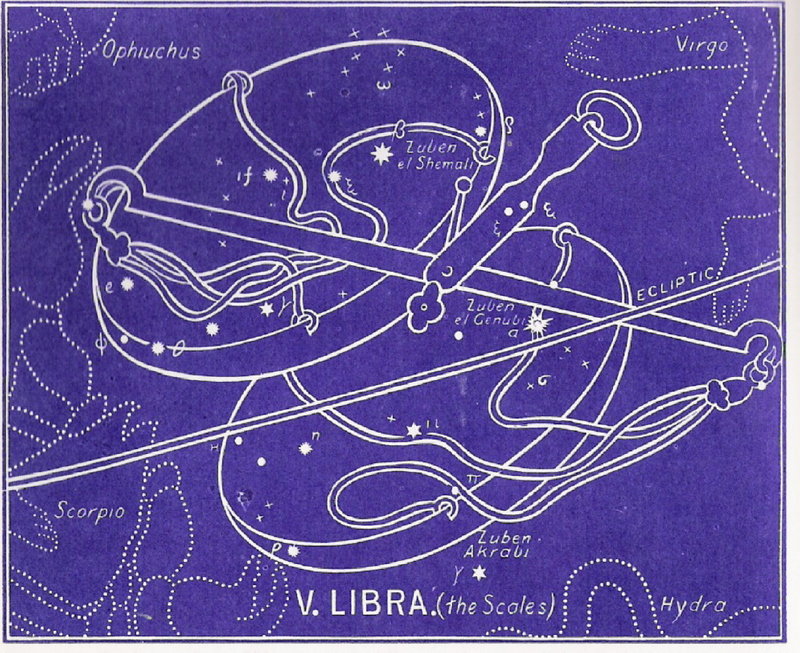 This theme is introduced by the chapter sign, Libra, and then amplified by the three additional decans. What is this provision? It is, of course, the Lord Jesus Christ. Specifically in this Chapter Two, it is the advent of Jesus in his first coming. All of the four signs of Chapter One, Virgo could be compared to all of the Old Testament prophecies that foretold the Savior’s coming. The remainder of Book One will be seen as the New Testament gospel accounts of His actual incarnation (or life here on earth). Book Two will continue this theme but it will compare to the New Testament up to the Book of Revelation, and then Book Three will compare to Revelation. Therefore, we have the past represented by Book One, the present (Church Age) represented by Book Two, and the future represented by Book Three. 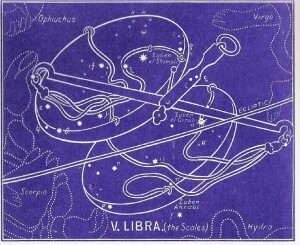 The picture of Libra is a pair of scales that looks forward to our Lord’s coming as Suffering Savior. This is seen in the names of two of the stars within that sign. They are found in the two balances, opposite of each other. One is ZUBEN al Genubi, which translated means the price which is deficient. This represents our spiritual bankruptcy, our complete inability to save ourselves. We will always fall far short of the measure needed. The opposite star is ZUBEN al Chemali which means the price which covers. This is the price that our Lord paid with his death on Calvary. This is the adequate provision from the hand of God! Only the blood shed from the perfect Lamb could be atonement enough for the penalty of sin. The good news of God’s love for man begins with a promise to a young virgin named Mary. Never touched by a man, she is to be the mother of the long-awaited Messiah. From her womb comes the One who will be perfect man, for he will have no inherited sin nature. Through him, the justice of God will be fully satisfied as He gives His own life as a substitute for man. A great harvest follows as the world bears witness to His love and power in the lives of His redeemed. To continue in the correct order of the ancient star chart, please select Crux next. Click on The Big Picture menu option to the left for more information about the Gospel in the stars.